The Institute for Inclusive Finance and Development (InM) organised a ceremony on 16 April 2017 in the PKSF Auditorium in Dhaka to launch a new book titled Rural Mechanisation: A Driver in Agricultural Change and Rural Development. The book, published by InM, is edited by M. A. Sattar Mandal, Stephen D Biggs and Scott E. Justice. Begum Matia Chowdhury, Minister of Agriculture attended the ceremony as the Chief Guest while Dr. Atiur Rahman, former Governor of Bangladesh Bank was present as the Special Guest. Dr. Qazi Kholiquzzaman Ahmad, Chairman of InM presided over the function. The book looks into the significance of the pattern of rural mechanisation for agricultural and rural development in Bangladesh. It identifies the policy issues and explains why this smaller-scale mechanisation transformation can serve as a strong driver of transformation of the rural economy of Bangladesh. The book indicates that the spread of small-scale equipment has resulted in widespread mechanisation of the agriculture sector in the country. Such mechanisation has also been accompanied by some workers leaving rural areas and finding profitable employment in urban areas and rising inflow of remittances. In many areas, shortages of labour at peak times have also led to substantial increases in real rural wages benefitting the poorer groups. This has brought significant dynamism in the rural economy with varied multiplier impacts. In regions where smaller-scale mechanisation has taken place, there has also been a growth of rural industries and strong linkages with the broader national economy. 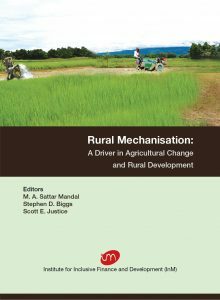 The book terms this distinct process of rural transformation through smaller-scale rural mechanisation as unique to Bangladesh which is not seen elsewhere where larger-scale commercial agriculture dominates. Among others, Mustafa K. Mujeri, Executive Director of InM, M. A. Sattar Mandal, co-editor of the book, Akhter Ahmad of IFPRI-Bangladesh, Wais Kabir, former Chairman of BARC and Timothy J. Krupnik from CIMMYT spoke on the occasion. Academics, policy makers, practitioners and representatives from the development partners attended the ceremony. The book is available at InM Head Office. Price: BDT 1,000; USD $25 (Hard Cover). For copies, please contact: Knowledge Management Division, InM. Phone: +88(02)8181066; email: info@inm.org.bd.